The time has come: Mica’s “Walk Idiot Walk” video is in the final round for the Google Idol video competition and he really needs support if he is going to win. Those who can are encouraged to vote every day. Likewise, please pass along the message to similarly interested others. If I were to win this competition, I have decided to donate the prize charity money to the Canadian Breast Cancer Foundation. A close family friend of ours was recently diagnosed with breast cancer, and I think it would be fitting to help her cause, and the many more that suffer from it. His post about this is here. This round ends on June 24th. As always, his videos can be discussed on his blog. [Update: 18 June 2006] With six days left in the contest, Mica is winning by 36 votes: 53% to 47%. [Update: 19 June 2006] Mica is down by 15 votes: losing 49% to 51%. Please keep voting and publicizing his video. [Update: 20 June 2006] Mica is up by 53 votes: 52% to 48%. The lead has switched back and forth a number of times in the past 24 hours. [Update: 22 June 2006] Mica’s up by just 5 votes, with more than 3000 cast. I have created a chart that shows the amount by which Mica has been winning or losing at various times when I have checked on it. As you can see, he has been winning in the majority of instances, though by decreasing margins as time goes by. If I had to bet on a winner at this point, based on the data I have collected, I would choose Mica. That doesn’t mean you can stop voting! 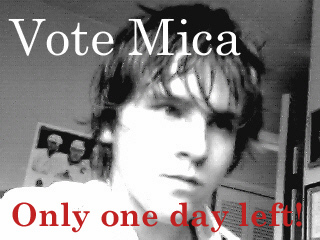 [Update: 23 June 2006] With less than 24 hours left, Mica is down by 50 votes: 1,874 to 1,924. This is the most I’ve seen him down by since the contest began, so please make an extra effort to vote today, before the contest ends. It finished on the 24th: at 7:00am Vancouver time, noon in Toronto or New York, 3:00pm in London, and at appropriately matching other times around the world. Thanks again for your support. Note: I am going to keep this entry at the top of the blog until the contest ends in three days’ time. The race is extremely close, so a big final push would be much appreciated. Fun fact: every computer can be used to vote once each day. That means your home computer, your work computer, your account on the international relations terminal server, and every adjacent computer in nearby libraries. He deserves this one. I will do what I can. Good. Spread the word. Feel free to hotlink the image above, or create better ones. I can provide image files, if you’re feeling really dedicated. Yeah, Mica’s is way better. And if the cash is going to charity, doubleplusgood. Please leave a comment here linking to any site where you put that image. Thanks. The other guy is in the lead by eight votes. Maybe you should put it on LiveJournal too if you have one. If you have a blog, feel free to post about this as well. There seems to be a Dutch Wikipedia page about the contest. It’s pretty damn cool to have your name on Wikipedia. I assume you’re cool with people hotlinking that image, right? The “Sabotage” video is a shot-for-shot remake of the original, or so I have been told. Another promotional link for this video is here. There is discussion of Mica’s video here. Generally, it is extremely flattering. It’s Mica 640 to others 638 right now. Of course, it seems like most of the voting for the other video happens while it’s daytime in Europe, and most of Mica’s while it’s daytime in Vancouver. His money phase should be coming up in the next few hours. Here is another blog backing your brother. The count right now is Mica 847 to others 894. We need to turn this around! Thank you all for the updates. I’ve been doing everything I can to publish this around the web without completely abandoning all schoolwork. More forum postings and blog posts from supporters are very welcome. Mica’s video is far more original, cleverer, and a win on his part would benefit charity. There are lots of good reasons to vote for him. Mica is down by 35 votes at the moment: that’s just 1.94% of the total. It’s actually 989 to 989 right now: just like the England-Sweden game, 2-2. I have been voting from 3-4 comps per day. Also, I put one of your bro’s banners on my blog for today. In a money-for-charity v. money-for-copycats fight, I’ll always promote the charity. Mica is down by 64 votes. Ack! Mica is up by 36! Booyah! Let’s just carry this for another 14 hours! apparently the polls have been closed and Mica was declared the winner. How very exciting ! I had the whole world voting for him today from Iraq to the Czech Republic. Thanks for all the support you gave your brother. This post has been linked from here.